I am traveling to the Yukon Territory to participate in the Yukon Riverside Art Festival organized by the Klondike Institute of Art & Culture (KIAC). I will collaborate with Hannah Jickling and Helen Reed during a six-day canoe trip down the Yukon River. We will give a presentation at some point during the Festival at the ODD Gallery. KIAC was established in 2000, as the operating arm of the Dawson City Arts Society, with an ambitious mandate to develop a broad range of arts programming to enrich the social, cultural and economic fabric of the Yukon Territory. 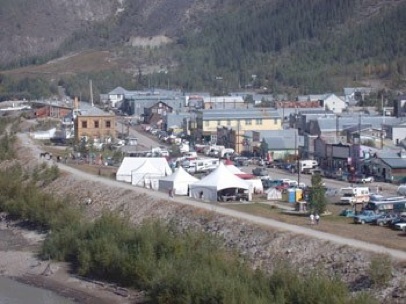 The Yukon Riverside Arts Festival is an annual KIAC summer event as part of Dawson City's Discovery Days weekend. As the name suggests the venue is parkland adjacent to the mighty Yukon River with participating artists coming from across the Yukon -Whitehorse, Carcross, Lake Laberge, Mayo, Keno, Dawson and NWT - Inuvik and Tsiigehtchic (and Oregon! ).